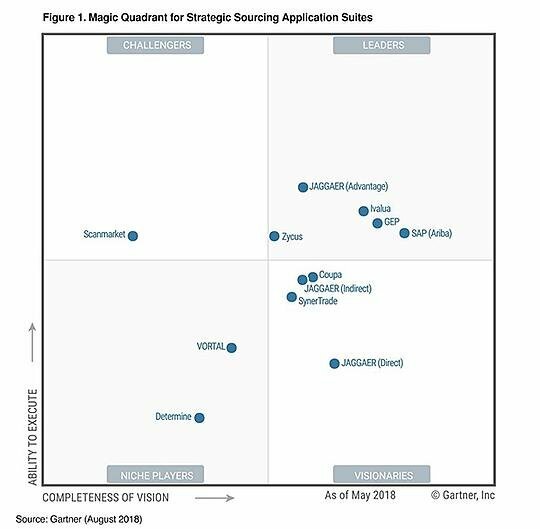 For the third time in a row, Gartner has recognized Ivalua as a Leader in Strategic Sourcing Applications. As the market for these solutions grows and becomes more competitive, we continue to show strong growth and innovative capabilities. This also provides further proof that companies need not compromise between a full suite and best of breed capabilities, as Ivalua delivers both to hundreds of the world’s most innovative companies. Companies looking to explore Strategic Sourcing applications, which include spend analysis, sourcing, contract management and supplier management can use this Gartner report to get an up-to-date view of the market and the representative players. Gartner Disclaimer: Gartner Inc., Magic Quadrant for Strategic Sourcing Application Suites, Magnus Bergfors, Patrick M Connaughton, Desere Edwards, William McNeill, (Publish date). This graphic was published by Gartner, Inc. as part of a larger research document and should be evaluated in the context of the entire document. The Gartner document is available upon request from Ivalua or reprint URL]. Gartner does not endorse any vendor, product or service depicted in its research publications, and does not advise technology users to select only those vendors with the highest ratings or other designation. Gartner research publications consist of the opinions of Gartner's research organization and should not be construed as statements of fact. Gartner disclaims all warranties, expressed or implied, with respect to this research, including any warranties of merchantability or fitness for a particular purpose. GARTNER is a registered trademark and service mark of Gartner, Inc. and/or its affiliates in the U.S. and internationally, and is used herein with permission. All rights reserved.